As noted in a previous post, I'm assigning writing by the Blerd Gurl in a couple of my classes this semester. This past Thursday, I discussed her article "Riri, Rhodey, and Re-Skinning: How Marvel is Misunderstanding Diversity" in one section of an introduction to literature class, which is comprised of all first-year black women undergraduates. Everyone was intrigued by the article, but of the 25 students in the class, only two of them said that they were active comic book readers. 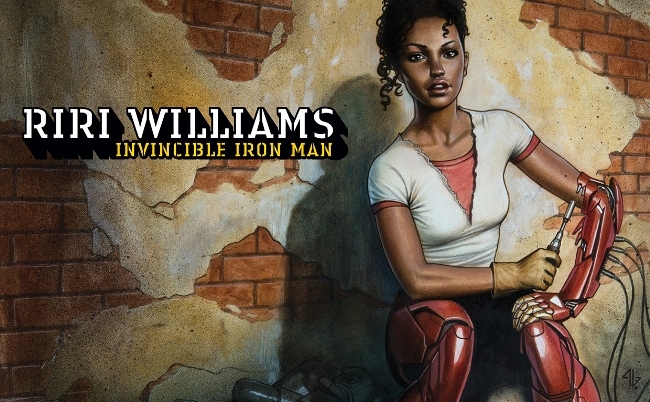 What's most fascinating is that those two had not really spoken out loud in class discussions, until Thursday when the Blerd Gurl got us talking about Riri Williams, Marvel, and diversity in comics. The introduction of a comic book writer with so much expertise in the classroom context empowered those students. The entire class, in fact, was impressed with the thorough knowledge about comic books and the Marvel Universe that the Blerd Gurl displayed. "I know some of you have said you've been called nerds before," I said, "but a nerd of what?" Folks were quiet. "What kind of nerd....or what kind of blerd is the writer of this article?" "A comic book nerd," people in the class responded. "Why does a black man always die or get maimed near the beginning of a Marvel Civil War? In the original Civil War comic it was Goliath (Bill Foster) and this time it’s War Machine (James “Rhodey” Rhodes) in CWII, and even in the MCU Rhodey’s paralyzed. Why was Riri the choice for the “new” Iron Man as opposed to Misty Knight, whose arm was personally created for her by Stark? Or even Rhodes’ genius niece Lila, (I’m referring to the Earth-616 version) who helped maintain Rhodey’s War Machine armor? Clearly she would know something about how the suit works, right?" I read that section aloud in class, and one of the young sisters said, "Ooooooo, she went in on them." Not enough of us do like the Blerd Gurl and go in on the diversity and representation problems enacted by major, multi-million dollar corporations like Marvel. It was somewhere at this moment in the conversation that I reminded the students of a line from Toni Morrison's novel Song of Solomon, where an important character goes, "Can't I love what I criticize?" Part of what makes the Blerd Gurl's argument so powerful concerns her love for or really her intimate knowledge of comic books. After the Blerd Gurl mentioned several women protagonists -- Storm, Lunella Lafayette, Anwen Bakian, and Misty Knight -- I asked the class about the black women fictitious characters that mattered most to them. Many said Olivia Pope from Scandal and Cookie from Empire. But not the women who read comics. Those two students said they were most interested in Batwoman and Catwoman, and then proceeded to say why they thought those women characters were, over time, more "independent" and compelling to them than other representations of women they had encountered. I suppose some people would question the importance and freedoms of Batwoman and Catwoman. For me though, I was more interested in what I was witnessing: these two typically reserved students had found their voices, began schooling all of us, and were transforming themselves into mini-blerd gurls before our eyes.